Training is important for any business organization. Not only new employees undergo training but experienced employees as well who are introduced to new concepts which will be applied in daily work operations. Training is usually conducted by the human resource department (led by the human resource manager) in collaboration with other top-level officers of the company. 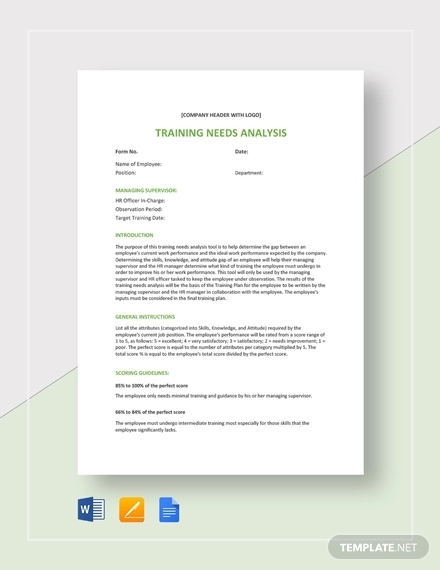 If you work on human resource and is tasked to create a training needs analysis, we have provided some examples that you will find useful when you will be creating your own analysis study. As previously mentioned, training is important for any business organization most specifically for employees. Trainings are not only meant for new employees who just started working for the company but for experienced employees who have been in the company for not only months but years. You may also see statement analysis examples. The main reason why training is a continuous process for any company is due mainly to one thing: technology. There was a time where technology experienced a slow gradual growth. But when the 2000s came around, technology was evolving at a breakneck pace. You may also like company analysis examples. In around 10 or 20 years, the things you see in the movies (i.e., humanoid robots with artificial intelligence, hologram technology, computer-controlled vehicles, etc.) will now be available to every consumer around the world. Due to the very fast development of technology, it has forced all types businesses to adapt, not only large corporations but also small and medium enterprises. Although technological advancements have mostly made it easier for businesses to conduct their daily operations, it has also made it difficult for business professionals to adjust to new processes which are made available every few years. You may also check out customer analysis examples. That is the main reason why trainings need to be conducted so that employees do not only learn new and faster technological processes but also assist their respective companies in adapting to the ever-changing business environment. It is a proven fact that businesses who don’t adapt to the environment will fail one way or the other. You might be interested in sales analysis examples. Take for example, Kodak (still focused on film cameras rather than producing digital cameras), Toys “R” Us (did not develop an e-commerce presence until it was too late), and Pan American World Airways or Pan Am (over-investing in a current business model and failed to innovate). These three companies have now all filed for bankruptcy. You may also see market analysis examples. 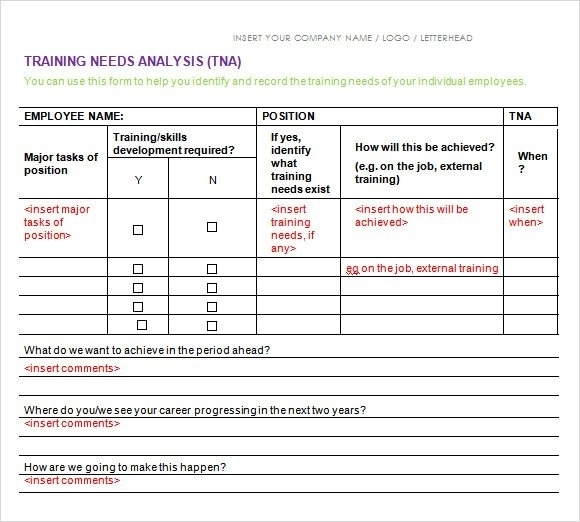 What Is Needed for a Company Training? 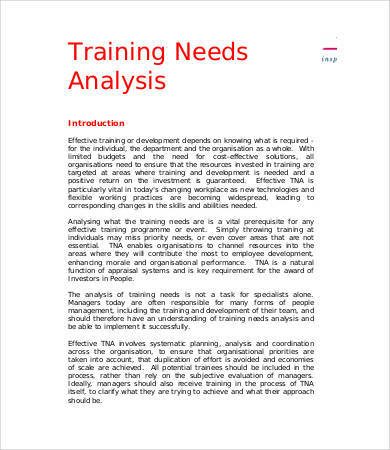 Since this article centers on training needs, we will be including the items that are essential for a company training. The items listed below may or may not be applicable for your training, and the items also depend on the nature of the training. If there is a training material that is present in all types of trainings (i.e., discussions, seminars, workshops, conferences), then it would be the laptop. The prices of these portable computers weren’t really affordable until the early 2000s; laptops have now been a staple in company trainings around the world. Not every participant may be using a laptop, but you can be assured that at least one or two may be using a laptop in one capacity or the other. You may also see literary analysis examples. Since laptops are mainstays in trainings, they are usually modified to fit the purpose of the training. Modified pertains to the specifications of the laptop. A high-powered laptop is often used for companies that conduct intensive trainings (more or less every week). These types of trainings are not only limited to simple presentations and minimal note-taking but focus more on skills development and learning new company procedure. You may also like industry analysis examples. Before laptops, there was the pen and paper. You may think that in the 21st century, laptops are more available in trainings than the classic and ever-so reliable pens (markers) or general sheets of paper—you are wrong. Even if laptops are made available for all the participants in the training, pens and paper are also made available for each as well, and not just for attendance and scribble/doodle purposes only. For some, using a pen can be more efficient than typing in a laptop, especially when taking down important notes. Basically, these individuals can write faster using a pen than write using a keyboard in the laptop. They can easily capture information and translate it in their notebooks, journals, or other writing material. 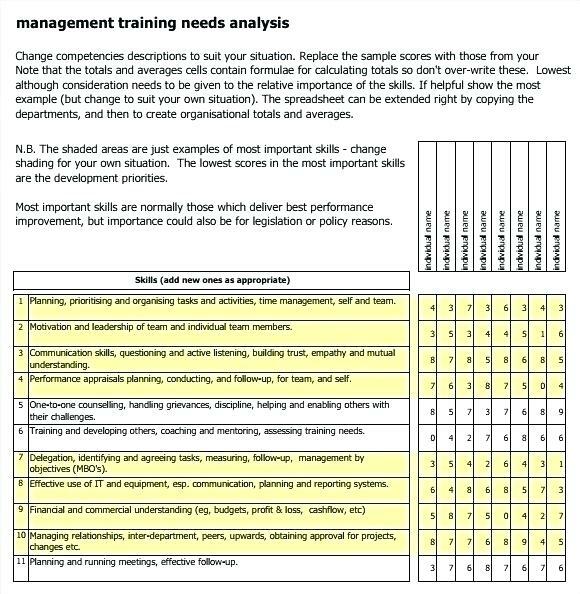 You may also check out needs analysis examples. If the company is limiting its expenses, then they should lean toward pen and paper as a good alternative to laptops. Purchasing laptops are already expensive in the first place, and maintaining them is as costly. You might be interested in operational analysis examples. Depending on the purpose of the company trainings, there is no need to purchase new laptops every now and then. If the company already has a number of laptops, constant repairs and check-ups are more ideal. 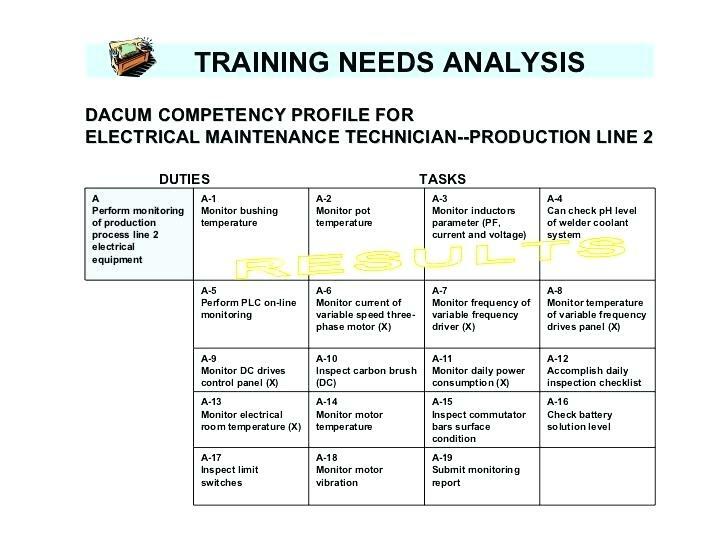 A company manual or training guide is another vital training need. A company manual or training guide acts as a blueprint for the entire training. When a company is established, a company manual is usually created by the top officers in the company. 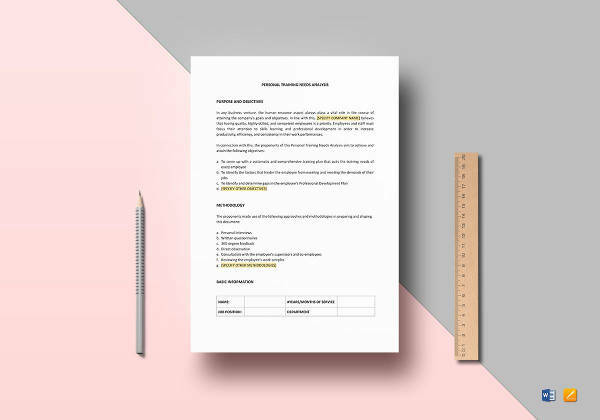 This manual will be implemented throughout the entire company and should be strictly followed by all employees, regardless of status or position. 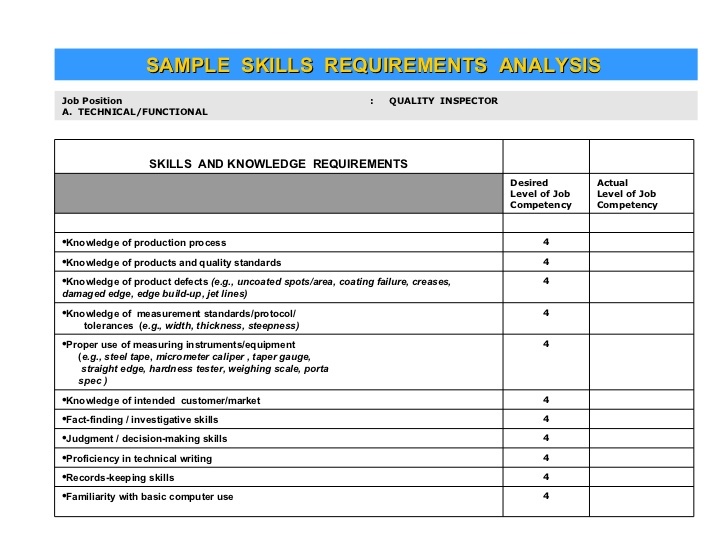 You may also see requirements analysis examples. 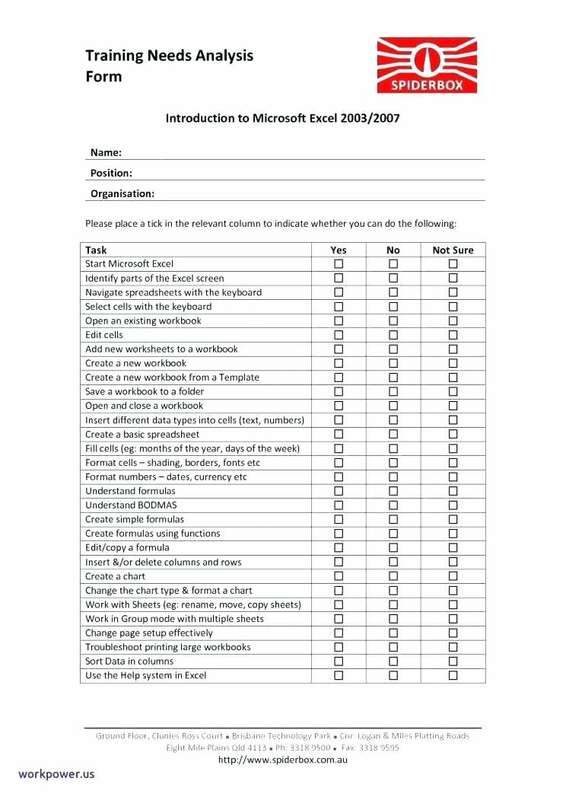 The company manual usually assists the training attendees in making sure the training adheres to the provisions listed in the manual. 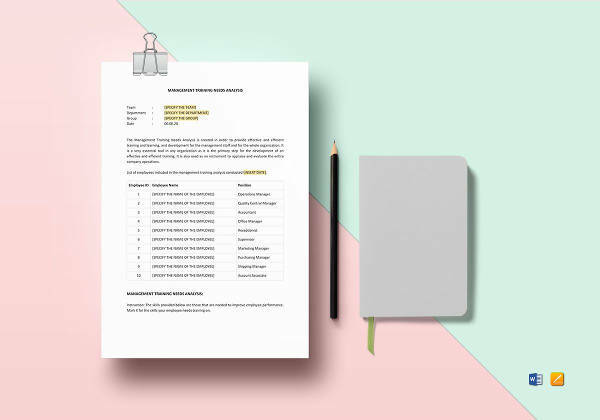 This manual also consists of confidential company and competitor information, and that is the reason why this type of business document should not be disclosed to anyone outside the company, even to stakeholders. Some trainings may involve creating strategies to gain an advantage against competitors, so the manual provides great assistance to the success of the training. You may also like financial analysis examples. Of course, a training is never considered a training if there are no people attending it. There might be a hundred people attending the training, or a thousand, or even just one person. As long as there are individuals who will be receiving valuable knowledge and information, and individuals giving those information, then the training session will be a success. 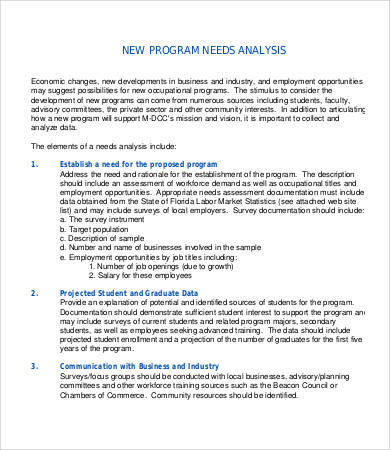 You may also check out organizational analysis examples. Take note that the results of the training are dependent if the training attendees learn anything from the actual training. The individuals who will be participating in the training will most likely be using what they’ve learned in the training in their future work responsibilities. You might be interested in SWOT analysis examples. Training is never complete without food or drinks. Of course, training participants need to be relaxed their minds and replenish their minds after hours of tiring and rigorous training sessions. That is why food or a few drinks such as coffee, juice, or even water need to be served during trainings. You may also see regression analysis examples. In regards to food, full course meals don’t need to be served, but it really depends on the number of training participants and the span of the training. If the training lasts for one whole week, you don’t expect to serve sandwiches and water alone to the participants or attendees. You may also like feasibility analysis examples. If you are looking for menu ideas for the seminar, look no further. We will also be providing you with the best menu ideas. Preparing food for the training should be hassle-free, and it is highly suggested that you purchase takeaway food from the popular fast-food chains or restaurants near your area. 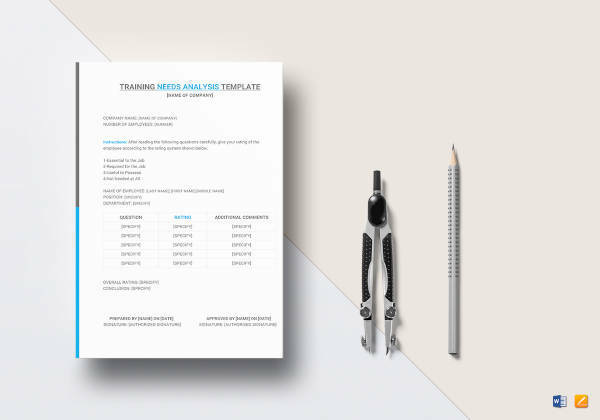 You may also check out analysis report examples. In regards to the type of the food, you may have some training attendees who are allergic to some type of food or are experiencing health issues. Go for vegetable, seafood, and chicken dishes as they do not only contain nutrients, but they are delicious as well. Training needs are not only limited to material things but the right mind-set as well. Individuals are attending training sessions not to simply be there and do nothing. Trainings demand full concentration from the individuals participating in them. After all, the training is meant to increase the knowledge and skills of the attendees. The knowledge and skills acquired by the participants will then be used in their tasks in the workplace. You might be interested in fault tree analysis examples. We hope you found this article to be informative and helpful as you will be creating your own training needs analysis. We also provided some examples that you can use as reference. You may also see financial health analysis examples. As previously mentioned, training is important for any business organization. Not only new employees undergo training but experienced employees as well who are introduced to new concepts which will be applied in daily work operations. You may also like process analysis examples.